The EU and UK have ambitious emission reduction targets and a growing need for energy solutions at an affordable cost for the long-term. Tidal lagoons offer a highly sustainable, low cost and low carbon solution to our energy demands and Tidal Lagoon Power’s vision is to deliver a fleet of tidal lagoons that cumulatively provide up to 8% of the UK’s power by 2030, but with environmental considerations at their core, forming an exemplary approach to renewables development. 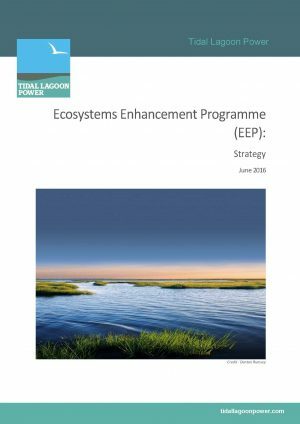 We place a reverence for nature at the heart of our work and therefore, in parallel to lagoon development, Tidal Lagoon Power (TLP) is driving an Ecosystems Enhancement Programme (EEP) – a habitat restoration, protection, creation and enhancement initiative on an unprecedented scale. Our work responds to the urgent need to tackle climate change, address sea level rise and provide energy security, whilst working with nature and facilitating a positive change for coastal ecosystems. Our mission is to give nature space to flourish. From a network of intertidal habitats and wetland reserves including mudflats and saltmarsh, to affording opportunities for flood defence, climate adaptation, community recreation, tourism and education to bring people closer to nature, we believe in time the EEP can become the largest habitat creation and restoration initiative in the UK and Europe. TLP recognises the complexity of the environmental challenges raised by development proposals but we believe economic growth doesn’t have to be nature’s loss.